Nintendo ends the Year of Luigi with Dr. Luigi, a puzzler that feels more like a green, L-shaped re-skin of the Dr. Mario series than a true sequel, due to its identical gameplay, much of the same music, and simplistic visuals. Fortunately, Luigi proves to be just as good a doctor as his more experienced brother, and fans of falling block/match puzzlers will likely have a great time with the tried-and-true mechanics and familiar style. Iconic Nintendo designer Gunpei Yokoi created the Dr. Mario series for the NES and Game Boy, and it is to his credit that the "Dr." series is still as fun today as it was in 1990. Puzzle fans will be instantly familiar with the gameplay, which can get chaotic and hectic as the capsules start to fall. 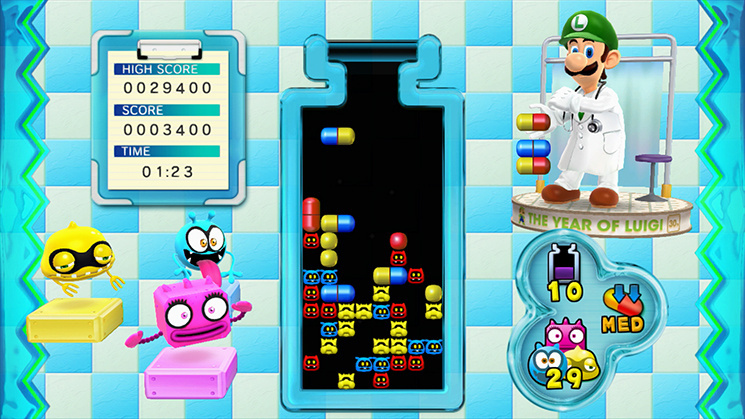 Dr. Luigi casts players as Luigi as he tries to eliminate red, yellow and blue viruses from a giant medicine bottle by vertically dropping in pill capsules with matching colours; these capsules contain one or two colours and can be rotated in all four directions. The objective is to match four or more capsule halves/viruses of the same colour, and when all viruses are eliminated the player wins. Similar to Tetris, filling up the screen to the top will result in Game Over. 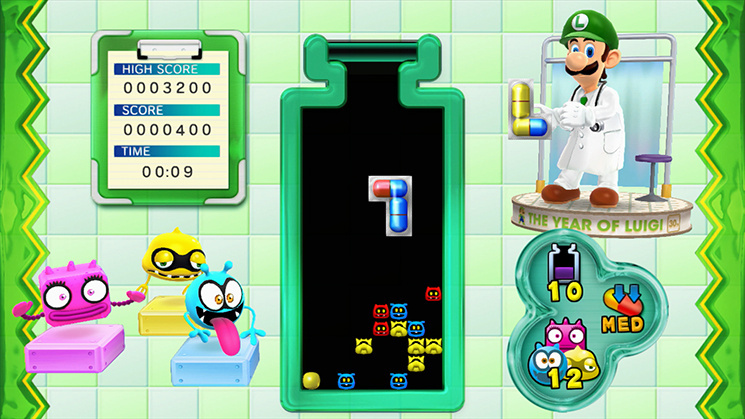 Dr. Luigi features a new mode, "Operation L," in which two capsules are combined together in an L shape and are dropped at a time — this is a good introduction to the game for newcomers, while "Retro Remedy" offers the classic game (with Luigi in the white coat, of course). In addition to Retro Remedy and Operation L there's "Virus Buster," where players use the GamePad to drag and drop the capsules. 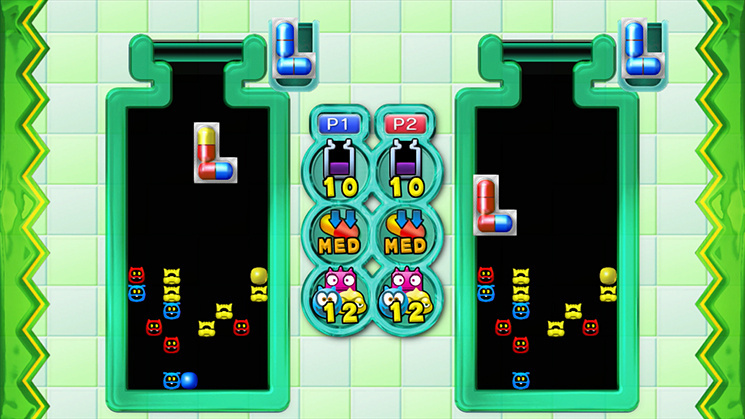 We found this mode to be a little too easy, with the touch screen play proving particularly forgiving; it's perhaps ideal for less confident players..
Local and online competitive multiplayer for the Operation L and Retro Remedy modes rounds out the experience, extending the title's shelf life considerably; each player can set their own difficulty and speed. With online play we found it easy to log on and find people to play with, and lag was non-existent. Playing this classic puzzler with a friend in local multiplayer is just as fun, and playing with the Wii Remote proved to be just as intuitive as the GamePad. Aside from Luigi taking over for Mario, Dr. Luigi's presentation remains unchanged from its predecessors. This includes the music tracks, which are selectable at the beginning of each stage, as well as the clean, no-frills visuals; the viruses have the same cutesy personalities that fans of the series have gotten used to. The structure is the same, too, and every five levels players will get a "Congratulations!" screen. None of this is to say that Dr. Luigi is a bad experience — it's just more of the same. 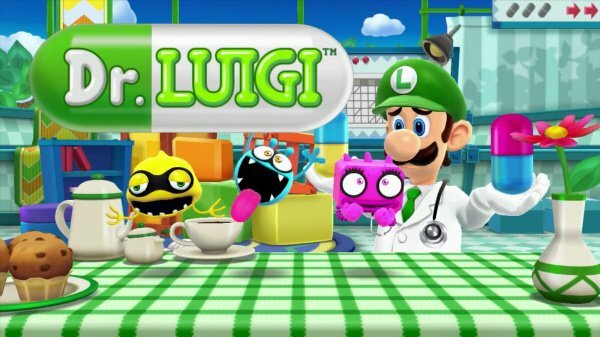 Dr. Luigi is a fun, if overly familiar puzzle game that will satisfy anyone who knows what they're getting when they download it from the eShop. While we would have liked a little more variety and some more twists for Luigi's puzzle début on Wii U, Dr. Luigi is a good way to end the Year of the Tall Green Brother. It's a simple, clear experience with strong gameplay that reminds us why we love the Mario Bros. in the first place. It is very expensive compared to e.g Magical Drop V (Retail of £3.99 - available for £0.99 fairly frequently). I'm really enjoying Dr. Luigi, but it is pretty much just Dr. Mario Online RX with one new mode and a Luigi coat of paint. I was disappointed that Retro Remedy mode features two less songs than what Online RX had, as Sneeze and Cough are left out. Virus Buster is more fun to play with touch controls than with pointer controls, at least. It's a really great HD version of Online RX, but it doesn't really improve on it in any major ways. Well, I've never played Dr. Mario before, so "more of the same" is not exactly a negative point for me. Looking forward to getting it next week! Am I the only one who would've liked "Year of the Tall Green Brother" better? I just think more people would know whose year it is that way...I mean no one likes Luigi, right? Overview says 1 player fyi. $15 for a polished rehash of a 20 year old game? I've been a huge Nintendo supporter for 30 years but I think I've had enough. With the value Sony and Apple are giving to their consumers, I am finding it harder to justify Nintendo's mentality. What I don't understand is why both this and NES Remix were $15 in the States, but in the UK NES Remix was only £9 while this is £13.50? I love Dr. Mario but I never knew this was going to be 15 bucks. I thought it was 10 like the WiiWare Dr. Mario. Pretty steep price for basically a colorswap. Still might get this though. I bet Dr. Mario for the Wii will be getting deserted online. So I still need to pick this up. I'll buy Dr. Luigi and NES Remix Later Down the Road. I would buy it if that part is fixed. 7 is just about right! I honestly believe $15 is a bargain because this is Nintendo were talking about here folks. Nintendo could of EASILY charged $19.99 or $29.99 who knows! I think for $14.99 there is a good amount of content and the fact that it has Online mode just sealed the deal. If it did NOT have online mode, then $14.99 would be a bit too high. @Kobeskillz Well it depends, if I were you I would go on youtube and watch the NES Remix video so that you can see all 16 classic NES games that are included in the NES remix game. See if any of the 16 classic NES games are yer favorites or not, etc. Then after that, watch a 10-15 min Dr. Luigi video, especially all the game modes and online mode. Now if you were one of those Nintendo gamers that bought Dr Mario RX Online from the Wii Ware shop via Nintendo Wii, then YES I would buy Dr. Luigi because I clocked about 110 hours of Online fun via Dr Mario RX Online cause it was FUN! Anyways, I own both BUT if you can only afford to pick one, I would more likely lean to the Dr Luigi game because it has online mode which equals endless replay value. On the other hand, NES Remix, once you unlock everything, there is not much to do except re-beat yer times? However there is an exploit that people are doing such as pausing the game and un-pausing to shave a few seconds off. It's classic Dr. Mario gameplay- nothing too new or different, though it feels new to me as it's been decades since I last played Dr. Mario. I will say, the Virus Buster mode it by far my favorite. It's the way the game is meant to be played I think. This is a game where touch controls really do justice. I like the online mode of course- always awesome to play against my friends. And the game does look crisp and clean. Definitely fits right in with all Nintendo's retail releases as far as visuals. I will get it when it is on sale (still need to get that Wii U though). @Legodavid18 agreed.. My first "DR Mario" is the Luigi game and I think it's really good. My OCD doesn't allow me to put it down. This game is awesome. Don't know how it only gets a seven with Luigi instead of Mario. It has online for Petes sake. So it's not as good as everyone expected? C'mon, it's Luigi's game! Atleast it's better than Mario is Missing. @Kawaii_Neko and better than marios time machine? How much content does it have compared to say Tetris DS ? (That is the gold standard for me for a Nintendo produced puzzle game). Also readily available for stuff like £6 which is crazy. I'll have to say, if you're a fan of 8-bit, go with the NES Remix if you cannot afford both. Dr Luigi is overpriced IMO compared to the $10 Wiiware and $5 DSiWare incarnations of Dr Mario. The "L" mode is a just a highly gimmicky add-on to justify the "Luigi" theme. The "L" pieces get monotonous after a while. But you know, it's Nintendo..
Bought it to play online, went on the first day and got absolutely CRUSHED. I don't know how to play Dr. Mario.. I'm really enjoying Dr. Luigi! One of the biggest issues for me with Dr. Mario was its more difficult approach to the Tetris-like formula. But Dr. Luigi's Operation L mode is a much more enjoyable experience if you ask me. Too bad 3DS didn't get this. It seems like a better portable game. @Ralizah There is a Dr Mario Express available for download on DSiWare for $4.99. I'm not sure how many players you match if you try to go online though. Edit: Dr Mario Express doesn't have online btw. It's a great little game though with all the modes of NES plus enhanced graphics, music, vs CPU, and it saves your scores. Strangely short review from NintendoLife. A bit high priced, but surely worth it, the gameplay videos look gold. I wonder how the online functions work when playing this. Too expensive for the basic modes it offers. If it had a good puzzle mode with different pre-defined levels i might have thought about it. A story mode where Luigi has to cure different other Nintendo characters with short dialogues before and after the levels could've been hilarious as well. The way it is this will have to wait until there's a 50 % discount. At least. I'm not sure I have a Dr Mario game in my collection but I am not sure I'll get £13.50 out of this. Will wait for a special offer or just buy the Wiiware one for half the price. This seems far too overpriced for what little it adds. Online and an "L-shaped pills" mode aren't significant enough additions to me. I really wish they would give this series an injection (haha) of creativity, because right now every game except for 64 has been the exact same game with maybe one gimmick mode. Instabuy for me. I'm hoping we'll get a Year of Peach next. Long overdue for the best character in Super Mario 3D World to get the spotlight! More Brain Training... if you know what I mean. @Technosphile Same thing happened to me with Dr. Mario & Germ Buster for Wiiware. I ran in fear of the online of that game, always some Japanese women would crush me in a mater of seconds. I see no reason to justify the price tag of this new re-hash really. Was pretty bummed that they didn't have multiplayer virus buster.. that's pretty much the reason we bought it.. but. it's still fun. THEY NEED t0 stick this puppy on the 3ds eshop too....after all Luigi would have !! It is hard to make a decision on getting this game. No offense to Luigi or any Luigi fans out there but they really should just stick with Dr.Mario...I mean I know it's always good to try new things but com'on... Dr Luigi tho... -_- Seriously. Well worth the price for the online multiplayer alone. I downloaded this today with my final Club Nintendo rewards. Meh, a boring game when it comes to a new Luigi game for thT Year of Luigi. Another more innovative Luigi game could've took this one's place. This game feels like a waste for The Year of Luigi but at least it is the better Doctor game out of it and Dr. Mario. I got it with a My Nintendo discount and it's right up my alley since Dr. Mario is an old favorite at my house and Luigi is my favorite Mario character with Yoshi in 2nd place. I also have the original Dr. Mario and Dr. Mario Online.